Alfonso Cuarón’s film about missile fragments wrecking a Hubble space shuttle killing one astronaut and spinning Sandra Bullock and George Clooney into a state of marooned drifting. There is a Russian station nearby and a Chinese one further away. Can they reach a station and get back to Earth…? One of the first Son et Lumiere films of 1894 was of a moon shot, so it’s highly appropriate that a film set in outer space should be a landmark in cinema. Gravity is visually superb, making 2001 and Silent Running look like toy models on black paper. The rolling three dimensional effect gives you an idea of what it might be like to be in space. The story itself is an old one in space movies: isolation in which space becomes a pervasive metaphor of the mind itself, which might struggle with the idea of God or loneliness or emotional issues. 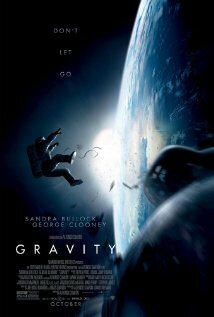 Gravity reminds me of that Ray Bradbury story about astronauts adrift in space. There is a reference to the ill-fated Apollo 13 which starred Ed Harris, and here he is the ground control voice. Bullock plays a bereaved mother (having a child always confers ultimate human status in American films). She plays a sort of Robinson Crusoe pioneer dealing with the Russian equipment in a Heath-Robinson way, never too fazed by the peril of her situation. When she gets emotional her tears float towards us (the film might have been called “Where Tears Don’t Fall”). She deals with the surrounding isolation and terror by using verbal distractions and noise for her comfort code. As she clambers out of her space suit she is like Ripley in Alien. In Gravity no one can hear you scream but there is no alien enemy, just the silence of infinite spaces that terrified Pascal. She adapts the foetal posture as if awaiting the emotional epiphany that came to Jodie Foster in Contact when she met her ‘Father’. Critics interested in reviving Freudian tropes might note the birth, womb imagery of the umbilical rope, the foetal appearance of the space suits, and the blazing projectiles from the space shuttle as they re-enter the atmosphere (they look like sperm hurtling towards the Earth egg). Spoiler Alert!!! As she ejects from the pod womb she takes staggering baby steps on Earth or maybe she’s Eve returned to paradise. At times George Clooney is laid back as if he’s still selling coffee but generally the tension is at breaking point. Please watch this excellent film. Tags: 2013, Alfonso Cuarón, drama, Ed Harris, George Clooney, great visual invention, Sandrs Bullock, Sci-Fi, science fiction, space adventure, stranded in space, thriller, You must see this film!!! !